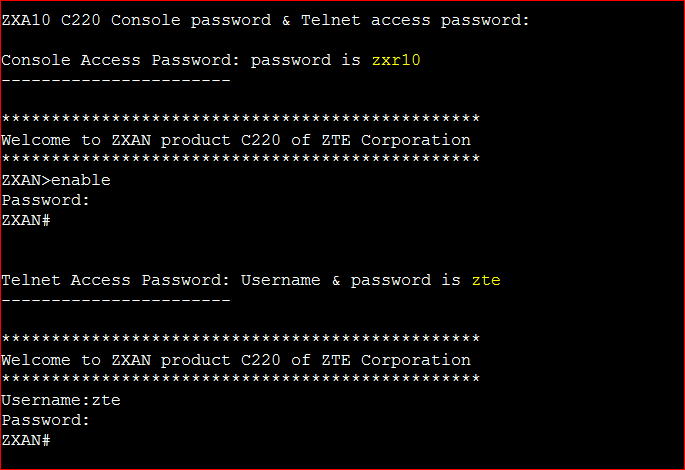 Today i will show ZXA10 C220 Console password & Telnet access password in CLI (Command Line Interface) configuration after logging in to the ZXA10 C220 through HyperTerminal or Telnet. Power on the ZXA10 C220 system. Perform this procedure to log in to the ZXA10 C220 through Telnet. In-band or out-of-band NM IP address is configured. Ensure that the NM IP address can be ping through from the maintenance computer. Step-1: Open a shell window, such as Putty, xshell, ZOC etc. Step-2: If the connection is normal, the login interface Enter zte as both username and password to log in to the system.